Tsai Ing-wen elected as Taiwan's first female president, handing a landslide defeat to the China-friendly Kuomintang (KMT) which pursued closer economic ties with the mainland over 8 years in office. 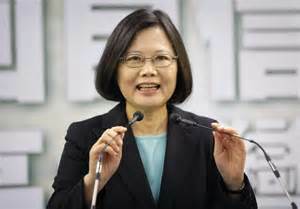 Tsai Ing-wen won around 60 per cent of the vote for the Democratic Progressive Party (DPP), which has been less enthusiastic about economic integration with China, while the KMT's Eric Chu admitted defeat garnering 30 per cent, with two-third of all polling stations reporting results by Saturday evening. The result should be deeply unsettling to China, which may respond by further reducing Taipei's already limited ability to win diplomatic allies and participate in international organizations. In a statement issued after Tsai's win, the Chinese Cabinet's body for handling Taiwan affairs reaffirmed its opposition to Taiwan independence, but said it would work to maintain peace and stability between the two sides of the Taiwan Strait. "Our will is as strong as a rock, our attitude unswerving on the principal matter of safeguarding national sovereignty and territorial integrity,'' the Taiwan Affairs Office said.